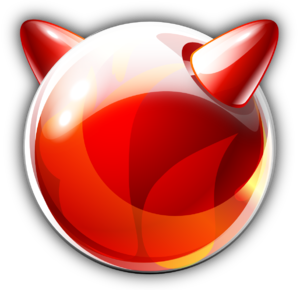 FreeBSD is a free and open-source general purpose operating system. It is based on Unix, as opposed to merely being a clone in the vein of GNU/Linux. It has a relatively small (in comparison to GNU/Linux) but loyal userbase, many of whom are fiercely loyal to the traditional 'Unix Way'. If its derivatives are taken into account, it holds the largest userbase of all open-source operating systems that are directly derived from Unix. Although not comparable directly to a GNU/Linux distribution - by virtue of FreeBSD not being a distribution (all of the base system is developed in a single tree rather than aggregated from elsewhere) - it shares a lot of similarities with Arch and Gentoo. Both Arch and Gentoo, for instance, have package management systems inspired by FreeBSD's Ports Tree - the (optional) Arch Build System, and Portage, respectively. BSD stands for Berkeley Software Distribution, as in University of California, Berkeley. The university acquired a UNIX source license from AT&T in the mid-1970s. Students started to modify and improve UNIX and called this modified version Berkeley Unix or BSD. Thus, the BSD project was founded in 1976, and further development ensued in the following years. In 1989, the first public version of BSD was released, which contained code from AT&T, and that meant that BSD recipients needed a license from AT&T. Subsequently, the development focused towards the removal of code from AT&T. The second public version of BSD, released in 1991, had no AT&T elements. After this second public release, BSD was ported to the 386 architecture, and it was renamed 386BSD. FreeBSD was derived from 386BSD, given that the latter's development had stagnated. The first public version of FreeBSD was released in November 1993, and development has gone on until present day. The original BSD project was released under a license that was quite permissive, the BSD license. The original 4-clause license allows complete redistribution and use of the source code and binaries. There was a caveat, though; in advertising material, credit must be given to the developers, and advertising material with this information must first be approved by the organization that developed it. Controversy ensued from these two last clauses, and motivated a family of similar licences to spawn, which contained the first two clauses mostly unchanged, but having removed the advertising clauses. FreeBSD is licensed under the 2-clause BSD license, also called FreeBSD License. The permisiveness of this license is what made FreeBSD have such a widespread use today. FreeBSD powers a good amount of software, having achieved a strong presence, if indirectly, on the desktop and on routers. Some examples are the popular NAS programs FreeNAS and NAS4Free, the PlayStation 4's OS, portions of the PlayStation 3's OS, OS X from Apple, and JUNOS from Juniper Networks. Furthermore, it's also used in servers, like in Whatsapp and Netflix. This page was last edited on 18 August 2017, at 15:22.